This venue is subject to a seasonal restriction due to nesting birds from the 1st February to the 31st July. Breaking nthis ban will seriously affect access to the entire area. For more details visit THE BMC REGIONAL ACCESS DATABASE. Another one of THE crags to climb on at Gogarth, the climbing here is adventurous, and the rock soft and at times unpredictable. It is however tameable by the mid extreme grade climber. We have to wait until the glorious 1st August to climb here, due to seasonally nesting sea birds. The approach to the crag depends on which route you are climbing. A long abseil rope (80m+) helps greatly. For the first route that start of the left abseil to the fin that separates left hand and right hand red walls. For the routes that start around Wendigo/ Red Wall there is a block that you can arrange a long abseil off towards the centre of the face, where it is possible with a long rope to descend straight to the bottom of the wall. A steep pitch on good rock which gradually deteriorates towards the top. Start from the grassy ramp of Red Wall Escape Route in a corner on the line of the abseil. Step up the corner and traverse rightwards to gain the small ledge on the golden wall, junction with The Electricification of the Soviet Union. Steep moves, in a rightwards diagonal line leads up past a good jug and a hard layaway until it is possible to move out left to a vague crack. Trend rightwards up the wall on brittle jugs to an old peg runner in a wide crack. Go straight up the wall on the left to finish just left of a chossy groove. Jim Moran, Geoff Milburn, Paul Williams, 11 Nov 1978. 1 25m 6a. Start as for The Cree to the horizontal break. Climb straight up from the old peg before the final fault line finish and belay at the fault line. 2 20m 5c/6a. Step right and climb up the wall left of Television Route. Quite a nice pitch. Mike Twid Turner, Ollie Cain and Mark Sykes 2 Aug 2007. “Excellent wall climbing on solid golden rock reminsicent of Right Wall but better”. Start from the right side of the large sloping ledge, by two loose spikes, as for Safer Start! Ascend to the remains of a peg (small wire), then go up and left into an alcove. Traverse six metres left to a small ledge (on The Cree), which is horribly close to the ground. Climb the crux of The Cree via steep moves, in a rightwards diagonal line which leads to a very good finger-slot. A hard move up gains better holds and a rest in a horizontal break. Step left and follow a vertical crack and continue via an undercut “ear” to a loose finish. Stevie Haston and Ray Kay, Aug 1986. Start as for Safer Start! and continue up to beneath a roof. A hard pull gains a line of holds leading up to join Television Route at the bolts and pegs. Follow the break up and left to finish out at a sandy recess via The Cree. Mike Twid Turner and Owain Jones, 6 Aug 1993. A left hand start which purportedly avoids the loose and scary start to Television Route, or maybe not! Start from the right side of the large sloping ledge, by two loose spikes. Go up to the remains of a peg (small wire), pass it on the left, until it is possible to move right to a sandy area below an overlap. Traverse right below the overlap to join, and finish, as for Television Route. Ben Wintringham and Marion Wintringham, Dec 1978. Once a sacrilege, but now a fine free route. Start at the spike belay mentioned for previous routes and climb leftwards to gain the main groove line which contains much rusting scrap metal. Go up and over the bulge on loose rock, and trend left to many pegs where the rock improves. Traverse right into a groove under an overhang. Follow this groove, via two overlaps, to a small ledge on the right. The left-hand groove above the traverse, with tempting pegs etc., has been climbed at the same grade. Climb the short wall, and finish up a groove, past the last of the scrap iron. Joe Brown, Ian G MacNaught-Davies, Tom Patey, Royal Robbins, Rusty Baillie, John Cleare, Dennis Gray, John Amatt, Roy Smith, Easter 1966. FFA Jim Moran, Ben Wintringham, Paul Williams, Al Evans, 13 Aug 1978. Start from the belay of Television Route or Redshift. Climb up past a peg runner into a bottomless groove. A peg at its top does not, unfortunately, seem to protect the moves up right to a ledge on the arête. Go back left into grooves and ascend a little wall to join Television Route at two pegs. Finish as for Television Route. Jim Moran and Paul Williams, 20 Aug 1978. Chris Parkin, Dave J Holmes 28 Jan 2005. A demanding route, especially on pitch 2, which has a sustained urgency about it. Start from the end of the second abseil, on the lowest ledge, in the corner on the right. 1 37m. 5b. Climb up slabby rock to leftward-trending cracks. Follow these, then bear right and go up to ledges and a huge block belay. 2 37m. 5c. Directly above the belay is a groove guarded by a square-cut overhang. The aim is to sidle into this groove from the right. Climb up above the belay, passing a thread runner and then move up and rightwards to a block level with the base of the grove. From here perplexing moves lead up and leftwards into the groove (old peg). (Blood Baath climbs direct to the start of this groove). This leads with continuous interest to a ledge on the left. Go back up right onto the larger ledge, and belay, as for Wendigo or, much better, continue up the third pitch. 3 12m. 4c. Move left into the continuation groove, which leads to the top. Pat Littlejohn, Hugh Clarke, 8 May 1976. Climbed during the restricted nesting season “by mistake”. The obvious line three metres right of Redshift pitch 2. Start from the block belay at the top of pitch 1 of Redshift. 2a 20m. 6a. Climb incipient cracks with increasing difficulty until an overlap, where a difficult sequence allows better holds to be reached further right. Continue in a fine position overlooking the fault line of Wendigo to join it midway up pitch 2 (possible hanging belay on right). Finish up Wendigo. Chris Parkin & Steve Long, 1988. Start at a ledge, just above sea level, left of the cove mouth. Climb the rightward slanting corner groove to a flake crack continuing rightwards. Gain the top of the flake and stand up by an inelegant and tenuous move. Climb up above and move rightwards around the blunt arête to a blocky slab. Continue diagonally right then up a dirty corner to belay on spikes at the foot of Wendigo. Howard Jones & Glenda Huxter, 1998. A poor route, but a very useful plan B. Start from block belays on the right side of the wall. 1 20m. 4c. As for Wendigo, pitch 1. 2 30m. 4b. Start as for Wendigo, then climb the diagonal break leftwards, heading for the sloping ledge at the start of Television Route. Block belays exist, a couple of metres farther along. 3 6m. Walk left to a belay on the ramp. 4 45m. 4b. Climb the slabby, and grassy, ramp to the foot of a slab. 5 15m. 4a. The slab leads easily to the top. Joe Brown and Dave Alcock, 15 Sep 1966. One of the best and most obvious lines on Red Wall, following the central continuous break, above the start to Red Wall Escape Route. The top half of the route is easily identified by some slim, right facing corners, containing sloping ledges. Start at the block belay, as for Red Wall Escape Route, gained from an abseil off the promontory. This point can be traversed to from the right. 1 20m. 4c. Enter the sand above and follow the easiest line of huge crisp holds to a sloping ledge. 2 50m. 5b. Climb the obvious leftward-trending break above, to a shallow depression where a corner starts to form, possible belay. Continue on up, passing two sloping ledges to a third sloping ledge on the left at the base of the top corner. 3 10m. 4b. Step back right into the ‘feature’ and carefully stumble to the top. Joe Brown and Tony Moulam, 6 Sep 1966. Start at the block belay, as for Red Wall Escape Route. 1 32m 5c. Climb right of Wendigo to cross Blue Remembered Hills and arrive at the belay of Red Haze. 2 15m 5b. Traverse right to belay in the sandy cave of Fantasia. 3 20m 5c. Exit the cave directly and continue diagonally leftwards to a good spike to the right of the last stance of Red Wall. 4 25m 5b. Continue up the steep fault line and wall right of the final pitch of Red Wall. D Howard-Jones, Joe Brown, S Boyden 10 Sep 2000. Tim Neill on No Way Jose. Photo Tom Grant. 2a 54m 5c. Bypass the Fantasia cave and continue up the rest of the route in one giant pitch. T Neill, T Grant, A Teasdale 4 Oct 2014. 1 45m. 5c. Climb the initial corner of Red Wall to the ledge at its top. Move left into a corner / groove and climb this to its top. From the top of this groove, move left and climb the wall to a large flake, swing left across this and make a hard move up to reach a peg. Sustained climbing up and left until forced to join Wendigo, then follow this to the sloping ledge. Poor belay (cam 3 useful). Note – this is not the Wendigo belay – which is higher up and larger. 2 28m. 5b. Climb rightwards passing a downward pointing flake, and swing into a hanging groove which is taken to join Red Haze at a sloping ledge, peg on the right. Using hanging flakes, gain the groove above (or climb the wall as for Red Haze). From the top of the groove more or less directly to the top of the crag. Gordon Tinnings, Paul Trower (first pitch with Dave Parker), 1 Aug 1980. The next weakness right has a well defined quartz filled break on the first pitch, followed by more committing terrain above. Start a little further right along the blocky ledge. 1 25m. 5a. From the left-hand end of the stance, move left into a shallow right-facing corner. Move right across the steep wall, and gain, then follow, a diagonal quartz break over two small bulges, to a recess. Here, a bolt belay can be backed up by a loose spike. 2 45m. 5c. From the loose spike move left, then ascend the steep wall, peg, until insecure moves lead left to a groove. Go up this to a sloping ledge, peg, then ascend the wall above direct to gain a groove, peg. After a few metres move rightwards to gain and finish up a shallow chimney. Joe Brown, Pete Crew (17 Aug 1969) 1 pt aid. FFA Jim Moran, Paul Williams (1979). A very fine main pitch, taking a direct line in the centre of the cliff, though only for the soft rock addict. Start as for the previous route. 1 25m. 5a. As for Red Haze, pitch 1. 2 45m. 5b. Follow the obvious sandy chimney, slightly to the right of the belay, passing two pegs. Joe Brown, Ben and Marion Wintringham. 13/9/78. A guaranteed crowd pleaser! Another route that looks terrifying, but which is far more attractive on closer inspection (if you like this sort of thing). Probably E1 if you’re in the right mood. Start from the ledge, below the main weakness. 1 34m. 4c. Move left and climb up onto a ledge. Climb up a couple of moves then traverse right to an obvious quarts flake. Bear left then right up a steep corner to pull onto the stance. A ‘devil may care attitude’ is suggested. 2 23m. 5b. A soft touch, but it just keeps on coming, and you can never be sure if those holds will stay where they’re supposed to! At least you know that the belay is solid. Follow the diagonal line leftwards, climb up to a peg, then cross the steep wall leftwards with some temerity to a shallow chimney. Rotting peg belays – best to continue. 3 20m. 4c. Pure Red Wall class! Jug pulling above a fearsome amphitheatre with an ‘admiring’ crowd stoking your ego from the sidelines. Can it get any better than this? Climb the steep chimney on monster holds, past a peg, and follow the groove above moving right to finish. Joe Brown and Pete Crew, 2/9/66. Excellent wall climbing, on solid rock once out of Red Wall. The route has reasonably good protection, and is sustained at an interesting level. Start as for Red Wall. 1 34m. 4c. As for Red Wall, pitch 1. Ben Wintringham, Marion Wintringham 28 Oct 1978 1 pt aid FFA Jim Moran, Paul Williams (1979). Neil Robertson and Eric Roseberry, 1970. A meandering route with serious climbing, especially on the first pitch. Start to the right of Red Wall, below the next sandy groove. 1 18m. 5c. Climb the steep groove to a ledge. Continue up the groove to emerge, covered in sand, on a good ledge. Poor belay. 2 40m. 5c. Climb rightwards and go up a corner, peg, before moving leftwards through shattered rock to a sandy ledge on the left (this is the sandy cave of Fantasia), peg. A horizontal traverse rightwards through a solid area of rock leads to an inverted V-overhang. Construct a belay at a good ledge just left of the curving fault-line of Communication Breakdown. 3 30m. 5b. Climb up for a couple of metres, then traverse six metres right to a groove. Ascend this and the corner above to a slab, which leads to the top. Ed Drummond, B Campbell-Kelly 20/21 Feb 1970. 1 18m. 5c. As for A Brown Study, pitch 1. 2 40m. 5c. Traverse the ledge rightwards and go right to a corner. Climb the corner to a sloping ledge and traverse 8 metres right to its end and belay. 3 50m. 6a. Drop down a metre and traverse right (loose) to a hanging red wall. Climb this, under a line of overhangs until a hard move brings you out on a slab. Top out, boulder belay. Mike Twid Turner, Kath Goodey, 19 Sep 1991. This is exciting stuff, exploring the obvious curving chimney on the right side of the wall. Start as for A Brown Study. 1 30m. 5c. Follow A Brown Study to the peg in the corner on pitch 2. Move out right from the corner and cross a compact wall to belay on a nice grassy ledge below a chimney fault-line. 2 45m. 5b. Climb the curving chimney, passing an awkward section near the top. D Cronshaw, D Knighton AL 10 Sep 78. Possibly the same line as Roadrunner R Perriment, D Carroll (1976). A good adventure, exploring the forgotten walls high on the right side of the crag. Start as for Red Wall. 1 34m. 4c. As for Red Wall pitch 1. 2 18m. 5b. Traverse up right and cross a steep wall, heading for a peg on the right of the chimney that A Brown Study encounters. A tricky descending traverse leads to a grassy ledge. 3 15m. 5b. Walk out right, then move up until a traverse right gains a stance at the base of a short corner. 4 37m. 5b. Climb the corner, ledge on the right, then continue up through broken rock, keeping to the left, until forced right onto a slab, and the top. J Brown, P Alcock 2 pts aid, 18 Sep 1966. FFA Stevie Haston, 1978. This route deals with the groove line 3 metres right of the start to A Brown Study. Climb up the groove, passing much sand, looseness, and brittle fins to join A Brown Study at the top of its first pitch. Belay on good rock in the corner above. Finish wherever you wish. Adam Wainwright, James Harrison (on-sight) 5 Sep 1996. Start five metres below the top of the ramp. Belay on a large ledge (on Red Wall Escape Route ramp) close to a large grey spike against the cliff. 1 30m 5c. climb the wall boldly above the grey pinnacle to a horizontal break, then move right, and go up to a sandy ledge. Move up right to the arête, and then continue right for 6m to good cracks, and a peg. Climb down for 3m, peg, and then across the wall reach a sharp downward pointing overhang/fang (recognisable by a small inverted V notch in its lip). Layback around this to gain a good ledge in the groove of Television Route. Small wires and small cam (F 1/2) required for the belay). 2 12m 5b. Climb down to good small ledges, then continue down for 2m, and step right to a corner (Redshift). Climb this, and move out right onto a sloping ledge, Wendigo, pitch 3 belay. 3 30m 5c. Traverse right to a small ledge. Move round the corner and onto a ledge on Red Haze. Go down the obvious broken grey ramp just right for 6m, until it is possible to gain the sandy white chimney/fault line (Rapture of the Deep). Move up slightly then right to gain a similar fault line (Red Wall final pitch). Descend this for 4m to its belay (a white sandy alcove with several ancient pegs). 4 30m 5b. Climb across the wall until it is possible, at 3m, to pass a small protruding nose. Move right onto the fine red wall to gain a good flake (Fantasia). Climb this, then trend diagonally rightwards making exiting moves using jugs on the lip of a small roof to gain another white sandy chimney/fault line (Communication Breakdown). Climb down this (or the more solid, ramp immediately right) for 10m to a good ledge on A Brown Study. 5 30m 5b. Move right then up to gain sloping, red ledges. When these end, head diagonally rightwards past sandy rock to reach a short red wall. Climb this, then head up and rightwards to reach a natural thread where the slab meets the wall. Pull over here, and head easily, but carefully to the top. Belay from a low flat boulder and with a braced sitting down stance against the path edge! Ed Drummond, B Campbell-Kelly 1 pt aid (1970) FFA G Tinnings, Leigh McGinley. 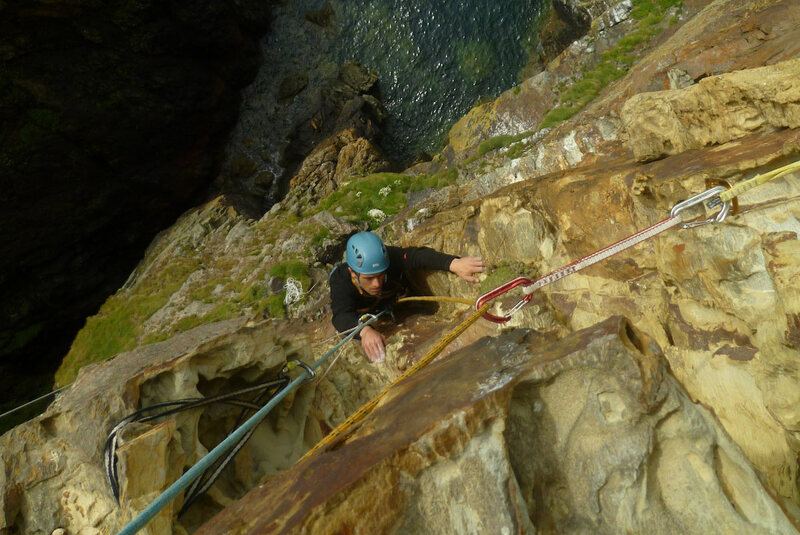 A link-up of the two ‘Red Wall’ girdles provides a superb Gogarth Adventure. Nowhere are the difficulties excessive, but thoughtful route finding, care with the rock and diligence in seeking protection are pre-requisites to a successful outcome. All members of the party should be experienced at this grade on the Red Walls. All belays are good. Best left for a quiet day! Start from the ‘col’ at the left-hand end of the Left Hand Red Wall, reached by a short abseil from a huge spike in the slope above the left-hand arête. Nut and spike belay. 1 30m. 5b. From the ‘col’, traverse right passing large spikes until a step up gains a ledge line. Follow this then step down to cross a rib. Ascend slightly, crossing Cannibal, then continue rightwards across poor rock. Move right and up to gain the stance of Left Hand Red Wall. 2 28m 5c. Traverse right, to a step down to gain a good spike. Move right (crux) and descend the groove of Heart of Gold (well-protected). From its base, ascend diagonally rightwards past The Super Calabrese belay peg to a protruding ledge. Climb down, and then go right to gain a large layback flake (Pagan). Follow this to a hanging stance at its top. 3 35m 5b. Follow the obvious horizontal crack line, which leads into Anarchist at a large detached flake. Continue up Anarchist (the juggy crack line) to belay on a large ledge (on Red Wall Escape Route ramp) close to a large grey spike against the cliff. 4 30m 5c. climb the wall boldly above the grey pinnacle to a horizontal break, then move right, and go up to a sandy ledge. Move up right to the arête, and then continue right for 6m to good cracks, and a peg. Climb down for 3m, peg, and then across the wall reach a sharp downward pointing overhang/fang (recognisable by a small inverted V notch in its lip). Layback around this to gain a good ledge in the groove of Television Route. Small wires and small cam (F 1/2) required for the belay). 5 12m 5b. Climb down to good small ledges, then continue down for 2m, and step right to a corner (Redshift). Climb this, and move out right onto a sloping ledge, Wendigo, pitch 3 belay. 6 30m 5c. Traverse right to a small ledge. Move round the corner and onto a ledge on Red Haze. Go down the obvious broken grey ramp just right for 6m, until it is possible to gain the sandy white chimney/fault line (Rapture of the Deep). Move up slightly then right to gain a similar fault line (Red Wall final pitch). Descend this for 4m to its belay (a white sandy alcove with several ancient pegs). 7 30m 5b. Climb across the wall until it is possible, at 3m, to pass a small protruding nose. Move right onto the fine red wall to gain a good flake (Fantasia). Climb this, then trend diagonally rightwards making exiting moves using jugs on the lip of a small roof to gain another white sandy chimney/fault line (Communication Breakdown). Climb down this (or the more solid, ramp immediately right) for 10m to a good ledge on A Brown Study. 8 30m 5b. Move right then up to gain sloping, red ledges. When these end, head diagonally rightwards past sandy rock to reach a short red wall. Climb this, then head up and rightwards to reach a natural thread where the slab meets the wall. Pull over here, and head easily, but carefully to the top. Belay from a low flat boulder and with a braced sitting down stance against the path edge! Mike Waters, Graham Hoey (AL) 28 Aug 2007.